Passpack is a highly secure software that stores passwords and allows access as and when required. Built on strong client side encryption, Passpack ensures that all your secret password data is accessible to you alone. Passpack supports two-factor authentication and creates one-time password for accessing the Passpack Vault, which makes it highly secure especially in public or unsecured places. The best feature of this software is it encrypts user data before it reaches Passpack serves, which means even the Passpack staff cannot access your sensitive data. Passpack is compatible with all the common browsers like Chrome, Safari, Firefox etc. It allows sharing of password combinations with others and even importing and migrating of usernames and passwords from other programs and spreadsheets. Passpack is a highly authentic and user-friendly password management software which is compatible for both individuals as well as teams. How much does Passpack cost ? The pricing for Passpack starts at $18.0 per year. Passpack has 4 different plans such as - Professional at $18.0 per year, Group at $48.0 per year, Team at $144.0 per year and Business at $480.0 per year. 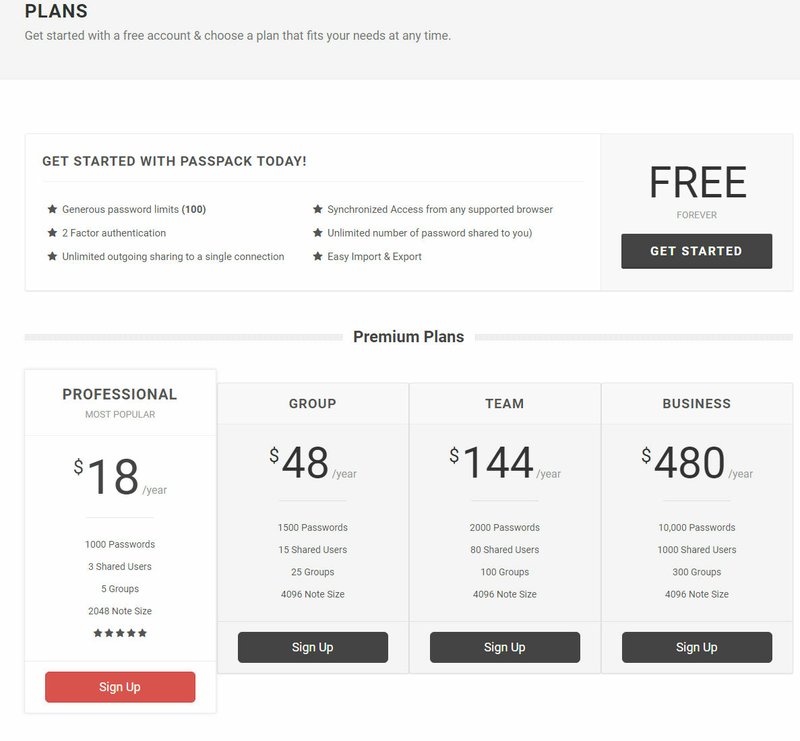 Passpack also offers a Free Plan with limited features. Disclaimer: The pricing details were last updated on 15/04/2019 from the vendor website and may be different from actual. Please confirm with the vendor website before purchasing. Cons: I wish they had a mobile app. Also, they had some changes in the management team, an in order to use the app, I need to use the correct link. - It stores in a best way along with the notes so I can carry all my data Securely every where. Overall: I have 9+ years of working Experience and I used the Passpack in all my companies. Pros: It's very easy to save info about a lot of accounts. I like the generate password option, I use it a lot. For business, it's easy to share account info. Cons: It's not very quick to login, but that shall be that way because of safety. Pros: I like that I can access my passwords and that it is all very secure. Cons: I don't like that they don't have an app so accessing on the go is more challenging. Overall: It's been good and does what I need it to. Pros: With Passpack, my passwords are super secure (I even forget how to login sometimes) so they are super secure from me). I can tag entries so I can have work and personal entries in one place. Updating entries is easy to do as well. Love this software! Essential for success with my clients. Pros: Easy to learn to use, easy to enter and update data. Double entry, complex passphrases for sign-in makes unwanted access unlikely. With multiple passwords for multiple business entities and several employees using the same applications and systems, Passpack keeps passwords safe and accessible to everyone on multiple computers. Also, Passpack makes it safe to access these same online systems remotely. The notes feature allows attaching additional information easily - like the security questions and answers some sites require. The live link feature allows one click for accessing the login sites of specific websites. An additional safety feature is that the application closes access to the password list after the site has been inactive for a period of time and requires re-entering the second passphrase to get back into the password section. Cons: The additional safety feature that closes the site when it's inactive is irritating because you have to keep re-entering the second passphrase OFTEN when working on several projects that require different passwords. I haven't found a timer and unlike some sites that pop up a warning box so you can choose to continue working in the secure site, Passpack just logs out of that area. This is a minor irritation for something that provides an added level of security in case someone is called away from their computer and didn't log out of Passpack before leaving the workstation. Overall: Secure way to deal with all the passwords we need to function in today's world. Pros: Passpack allows to save passwords and share among certain users and/or groups of users. You can save notes to every entry if you want to store your answers to secret questions, for example. Easy to manage and to use. Cons: There is a double security, first you enter your password to access your account, and then you enter your passphrase. If you ever forget you passphrase, it can not be restored/reset and you will have to create a brand new account. I wish there was a way to answer a set of questions and get passphrase reset. Very pleased and suitable for big teams! All in all a stable and solid service that does exactly what you need. Cons: One thing that really annoys me (and I would say maybe the only thing at the moment) is that when you are logged on for a while the service automatically reboots (in a sense) resulting in it interrupting whatever task I was doing. Overall: We have reached a point to being able to control and manage all the company credentials and have the ability to provide and remove access within a few clicks. Comments: This website allows you to securely save passwords. It is very useful since everyone has so many online accounts and passwords that they have to either remember or keep track of somewhere. The different functions are great too. You can put the name of the entry, the username, your password, a link that you can click to go to the right webpage, and notes where you can type in any other pertinent information. You can also share passwords with your coworkers or family members (there is a limit of how many people you can share with if you use the free version). The security features include two-step login, automatic log-off, and blacked out boxes over the passwords and notes unless you click to view them. "Knock out of the ballpark!" Can be difficult to user for a non-technical, first-time user. Ensuring that certain sites and services are accessed by the correct person.